As we started the ascent to Brian Head you could feel a weight begin to press in on your chest. I don’t think I have ever felt that horrible in a warm up before. My legs felt like they were being pulled in all directions. People have been raving about the single loop course and from looking around we knew it would be good. The sun decided to shine on us today and the race got off to a good start. First we climbed up a long paved climb. My heart rates were really high in warm up and I knew other girls were much more used to altitude so I just sat in and let them work. Willow Lead most of the climb which eventually turned to dirt and continued up. She paid for her effort though and got popped before the crest. It was now just 6 of us: Heather, Dara, Shonny, Georgia, Jimena and myself. I was feeling the effort pretty good and not knowing how much climbing was left I had to ease up. I crested the next climb to see the girls funneling into a single track climb ahead of me. Damn, I was almost there. Katerina Nash then bridged up to me going a really good clip and I followed her down the first descent. Not having seen anything before I just crossed my fingers the rocks she was riding off had good landings. She was screaming down the hill and I couldn’t match her on the day. A lot of the men had flatted on this rock strewn stretch, but the women made out okay. The descents were all fast big ring stuff. By the second substantial climb we had climbed from just under 2000m to 3300m! Ricky summed up the race with the words, “I’ve never dug so deep to go so slow”. Gretchen Reeves caught up to me at the base of this climb and we rode it together. Going into the descent I slid out a bit on a loose corner and she got a gap. The next couple descents were rough and twisty and I felt great. I was catching the categories that had done the shorter loop and hoping I could make up some lost ground here, but everyone must have been riding well. Apparently Katrina Nash caught the lead girls here and was putting the hurt on them. I didn’t see another of my competitors for the rest of the race and managed to salvage my 8th place position. I wish I had known before what the last 20 min of the course was like. I think I could have finished a lot stronger if I knew how much energy I could use or had to conserve. It was a great race and a good altitude experience. I caught views of red rock mesas below from the climbs and zipped though a beautiful birch forest. There was a lot of single track and A LOT of climbing which didn’t feel so hot at over 2000m. I don’t think I’ve ever been so beat after a race. Man did Wendys taste good!! Kabush was 2nd, Ricky 10th, Toulouse 17th and Matt 30th. After the race I wasn’t much feeling like Short track the next day. Keith let us all hang out in bed as he cleaned our bikes and checked them over. What a guy! After a good sleep and a spin in the AM (See interesting notes) I felt like a new person. Warming up didn’t feel nearly as bad today. We used the same start for the short track and then headed onto the dirt, into two 160 degree corners and then a nice corner straight up a hill and jump and down a rough trail back to the pavement and headwind. I got off to a good start in the 20 min race and was able to secure a top 8 position by being aggressive through the tight corners. There were primes on the first two laps so the race broke up right away with a group of 8 of us off the front. I was able to stick with it for 16 min before letting a deadly gap form. I then was in the fun position of no man’s land as I TT’d behind the leaders, but ahead of the chasers for the rest of the race. Still it was by far my best Short track performance and I finished 8th and actually rode with the leaders in a crit style event! It was the same 8 girls as yesterday with the exceptions of Sue Haywood winning today and Gretchen Reeves dropping out. She had won the marathon that morning!!! Matt and I did a spin from Beaver into the surrounding country side. On a 3 mile section of highway we saw 75 road killed rabbits! 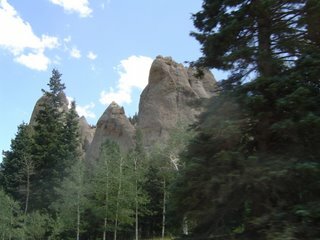 ……Later that same day while driving to Fruita (through some crazy scenery!) a rabbit found luck to be on his side as he darted out in front of our car and managed to be missed by all four wheels as we zoomed over top.